Winterblaze, the third novel in the Darkest London series, is about Poppy, the oldest sister, and her estranged husband Winston Lane. In the last novel Winston had been mauled while investigating the werewolf who had been stalking Daisy, Poppy’s sister. Because of that, this whole “other” world had been opened to him, including the role his wife plays in it, unbeknownst to him. After learning that their 14 years of marriage has been built on lies, he left Poppy and went off to brood. Three months later, Poppy forces Winston to face her. While trying to figure out their feelings, they discover a murder, and fall into an investigation that becomes about more than life and death. It is about saving Winston’s soul. After having read the previous two novels about Poppy’s sisters, Miranda and Daisy, in the books Firelight and Moonglow, we knew a little bit about both Poppy and Winston. 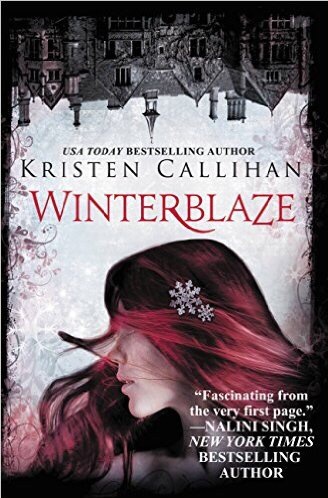 In Winterblaze, we find out that what we had learned previously was not in fact the whole truth. Poppy had been hiding her true nature from her sisters as well as from her husband. Miranda, the youngest sister, had been able to call up Fire, Daisy had turned GIM (an immortal) in the previous book, and Poppy, we discover, had been the mysterious leader named Mother, of the SOS, a kind of police investigative force for supernaturals. Interesting that her life actually paralleled her husband’s for the entire 14 years of marriage, as Winston had been a police investigator up until his attack. This novel gave us a resolution to the sister storyline, now that they all knew their supernatural natures, and allowed Poppy and Winston to rediscover each other in their new roles, while investigating. Something that each of them do very well. Kristen Callihan has a gift for storytelling, and as with Firelight, the tension between the main characters build both emotionally and sexually. When they finally reveal their emotions to each other the climax is achieved on many levels, finally giving the reader relief from that tension, and satisfaction with the conclusion to the story. Thank goodness this series has quite a few books already published so I can immediately move on to the next! Buy it on Amazon, Barnes and Noble or Kobo!